Spring has been a time of great new projects and discussions at the Campaign. Our LANE Conveners have started a conversation on increasing consumer engagement in their local stakeholder groups. Resident and family engagement is a priority for the Campaign. Interested in becoming involved? Please let us know: Info@nhQualityCampaign.org . In June we’ll have our first all-stakeholder call. The topic of this call is a novel partnership between the state QIO and the state Survey Agency. Please read below for more information. Sharing is a theme around here, and we need to hear from you! 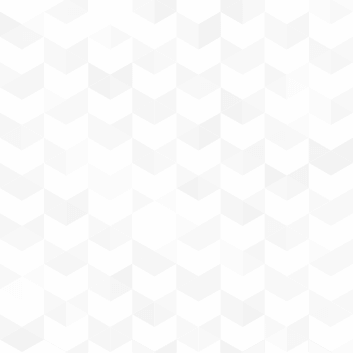 Our website wizard has made a fun, online form for sharing Success Stories. You can share the overall success of your project, or a single step along the way. We have a number of prompts and you can choose which work for you. You also get to choose with whom to share (or not to share). The form generates an automatic email back to you with your complete story, ready for YOU to share! We need some pilot testers to give this a go before we make this feature live on the website. Interested? Please drop us a line and we’ll send you the link to test it out: Help@nhQualityCampaign.org . Read on for some exciting news about the availability of comparative data. And as always, thank you for making our long term care communities better places to live, work and visit! 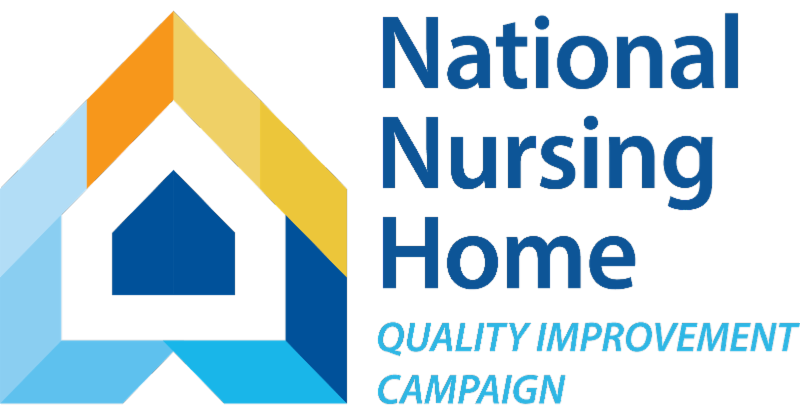 The NNHQI Campaign was formerly the Advancing Excellence in America’s Nursing Homes Campaign. Read more. A new evidence-based toolkit from AHRQ can help long-term care facilities reduce catheter-associated urinary tract infections (CAUTIs). We are pleased to announce that Campaign-wide comparative data are now available for all measures on each of three goals: Staff Stability, Consistent Assignment, and Hospitalizations. Long term care providers monitoring their quality improvement project on one (or more) of these goals using measures calculated with a Campaign Tracking Tool can now opt to compare their progress with the aggregate experience of other communities working on the same goal (see figure, right). To view the Campaign-wide median trend for a measure, log into your account and open your “View My Progress” page (Trend Graphs) for the goal. Select the measure you would like to view. To enable the option to display the Campaign-wide trend, you will need to select only one stay type or staff type (depending on the goal). Remember to set a target, and you can display your target line on the graph as well. 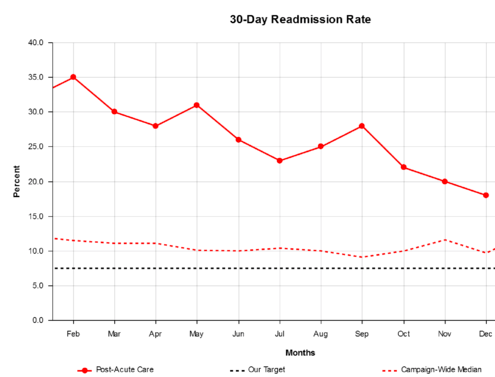 Participant progress, solid red line; Campaign-wide median, dashed red line; Participant’s target, dashed black line. When viewing the Campaign-wide median, please keep in mind that the trend reflects the aggregate experience of communities submitting data each month. Each month includes a mix of communities who have been working on their quality improvement project for months, or even years, as well as communities who are just beginning their project. It is also important to remember that the Campaign-wide data trend is not nationally representative. It reflects only the experience of communities who have chosen to track their outcome data on the Campaign website. These data have been self-reported by participating nursing homes. The data are collected and tracked by the nursing homes for internal quality improvement purposes. In some cases, homes enter data on the website to fulfill state incentive program requirements. The Campaign-wide comparison data has not been risk-adjusted. The HelpDesk Team is available to answer questions and for support accessing or customizing your displays. Working with a group of communities? Six free on-line nursing home training sessions on important concepts and practices that promote team communication, antibiotic stewardship, and C. difficile prevention are now available. Nursing contact hours or a certificate of completion is available after completing each one of the six sessions between April 1, 2017 and September 30, 2019. These sessions were developed by the Quality Innovation Network National Coordinating Center (QIN NCC), under contract with the Centers for Medicare & Medicaid Services (CMS). For more information and complimentary resources check out the Campaign page on C. difficile and Antibiotic Stewardship. Please join us June 13, 2017 at 3pm ET for a special all-stakeholder call highlighting an innovative quality improvement training program, QAPI Push. QAPI Push is an intensive 6-week instructional series that joins forces with state survey to assist nursing home staff with mastering the principles of Quality Assurance Performance Improvement (QAPI) while temporarily placing state surveys on hold. Telligen Nursing Home Quality Program Specialist Linda Savage, RN, BSN, CDONA/LTC and Colorado Department of Public Health and Environment (CDPHE) Nursing Facilities Section Manager Jo Tansey, RN will lead our discussion. We’ll also hear from a local nursing home participant and how this program is being adapted in another state.